According to a report from the Centers for Disease Control and Prevention (CDC), more than 2 million Americans become infected with antibiotic-resistant bacteria each year, leading directly to at least 23,000 deaths and contributing indirectly to thousands more. Antibiotic resistance occurs in the community, in long-term care facilities, and in hospital settings. Another CDC report on preventing healthcare-associated infections (also discussed in this AFP article) identified six high-priority antibiotic resistance threats: carbapenem-resistant Enterobacteriaceae, methicillin-resistant Staphylococcus aureus (MRSA), extended-spectrum beta-lactamase-producing Enterobacteriaceae, vancomycin-resistant Enteroccocus, multidrug-resistant Pseudomonas, and multidrug-resistant Acinetobacter. Antibiotic overuse is a multifaceted problem with many potential solutions. On Sunday, July 9th at 7 PM Eastern, Dr. Jennifer Middleton (@singingpendrjen) and I (@kennylinafp) will be taking a deep dive into the evidence on the most effective strategies to curb prescribing of unnecessary antibiotics. 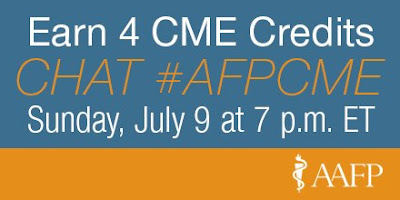 AAFP members and paid AFP subscribers can earn 4 free continuing medical education credits by registering for the #afpcme Twitter Chat, reading three short AFP articles, and completing a post-activity assessment. We and @AFPJournal hope you can join us! Being active on Twitter can have many advantages for family physicians. Following journals like AFP (@AFPJournal) can make it easy to keep up with the latest medical studies and news. With individual tweets limited to 140 characters, Twitter chats provide a way to explore a particular issue more in-depth and build connections among people with common interests. Increasingly, they can also be a way to increase physician knowledge and even obtain continuing medical education (CME) credit. Typically, Twitter chats occur at a scheduled time, last for about an hour, and are moderated by one or a few members of the hosting organization. The topic for discussion is determined in advance, and the moderators usually prepare questions to ask participants throughout the hour. Participants can tweet responses to the questions - and to each other's responses - during the hour, and the conversation can be reviewed later by searching for the chat's hashtag. You can see an example of a Twitter chat here. Several medical journals and organizations are using Twitter chats (or virtual journal clubs, as some journals prefer to call them) to engage with their members. The Annals of Family Medicine and the Society of Teachers of Family Medicine host regular Twitter chats covering a variety of clinical and educational topics pertinent to Family Medicine. In other specialties, Journal of the American Geriatrics Society, American College of Chest Physicians, Annals of Emergency Medicine, and the Society of Hospital Medicine all host or have hosted Twitter chats. Using Twitter for medical education can have tangible benefits. Medical students who participated in Twitter activities relating to biomedical science studies had higher grades than those who did not. Medical students who participated in Twitter activities related to gross anatomy classes reported better communication with faculty, higher morale, and less anxiety. A general surgery program used a competitive Twitter microblogging project to improve their residents' in-training exam scores. An Australian research group found that online CME using Twitter and other social media platforms was perceived as more cost effective for physicians compared to attending live CME conferences. Last year, AFP hosted its first Twitter chat, and this year, on July 9, we'll host our first Twitter chat for CME credit on the topic of antibiotic overuse. You can claim 4 hours of CME credit for participating; the chat will be 1 hour, and the additional 3 hours are allotted for the preparation time to read the articles. You can download the articles we'll be covering, learn more about the basics of a Twitter chat, and register here. If you have questions about how to get involved, you can tweet @AFPJournal or email afpedit@aafp.org. What benefits or barriers do you see to using Twitter for CME? Debate within the medical community regarding when and how to screen for breast cancer, prostate cancer, and colorectal cancer continues. Helping patients make informed decisions about how they wish to participate in these screenings can be a challenge for busy family physicians. Two recent articles address this challenge by providing several solutions to help us help our patients make informed decisions. The first article is a report of a large cohort study based in Virginia that examined patients' use of an online decision module regarding breast, prostate, and/or colon cancer screening. Patients were invited to view the module if they were overdue for consideration of these screenings (women aged 40-49 without a mammogram in the last 2 years, men aged 55-69 who had not had prostate cancer screening in the last 2 years, and men and women identified as overdue for colorectal cancer screening). Uptake was low; about 20% of the 11,000+ eligible patients began a module, and only 7.9% completed a module. Of that 7.9%, though, about half felt that it enabled them to have a more helpful conversation with their physician. The second is a review of shared decision making techniques and resources in the current issue of Family Practice Management. The article reviews clinical circumstances when shared decision making is relevant and also reminds readers that shared decision making is an integral part of the United States Preventive Services Task Force's (USPSTF's) recommendations on breast cancer screening for women aged 40-49 and lung cancer screening. It describes the 6 general steps of shared decision making along with 3 tools for using shared decision making with patients: SHARE, the 5 As, and IAIS. The article also includes a table with online resource aids for patients; the first, healthdecision.org, provides neat graphics that may make concepts like "prevalence" and "false positive" easier to discuss using lay language. You can read about these and other controversies in the AFP Department Collection on Editorials: Controversies in Family Medicine that also includes a search engine. You can also read more about cancer screening, diagnosis, and treatment in the AFP By Topic on Cancer. What shared decision making techniques and/or tools have you found useful?